This affordable yet exclusive lounge bar and nightclub really has it all, offering an unparalleled nightlife experience elegant daytime light bites, as well as being one of the best live music venues in Tenerife. The stylish interior provides the ideal backdrop for an evening of chic, unadulterated indulgence. If you feel like dressing up to paint the town red, Magic is the place to be. Offering a comprehensive champagne and wine list, as well as premium spirits and cocktails expertly prepared by the club’s mixologists and brought to you with a warm smile by the waiting staff, your preferred tipple is just a subtle call away. Magic Lounge Club is famous for its unique live music and is now host to the fabulous M3 band. M3 is made up of a special collective of musicians famous on the island for bringing you the best in contemporary hits and fun medleys to dance the night away. Many of you will remember Paul Fitzpatrick and Jonny Grennan who are renowned for their quality stage presence and crowd pleasing escapades. Joined by Marc Craig, a member of the famous Wild Boys, the group has become the live act that everyone wants to see. M3 perform exclusively at Magic Lounge Club, Sunday to Thursday from 10.30pm onwards. The weekend is also filled with a mix of top live acts, dancers and the resident DJ Nato, spinning the funkiest tunes from the 70s to today. The classiest establishment in South Tenerife is not only exclusive to sundown; Magic is also a chill out café during the day that offers a wide selection of feel good foods and juices and is the ideal spot to relax and watch the world go by. On a recent company night out, Island Connections staff enjoyed an aperitif in Magic Lounge Club before crossing the road for a fine dining experience in another Venture Restaurant establishment: Thai Botanico. 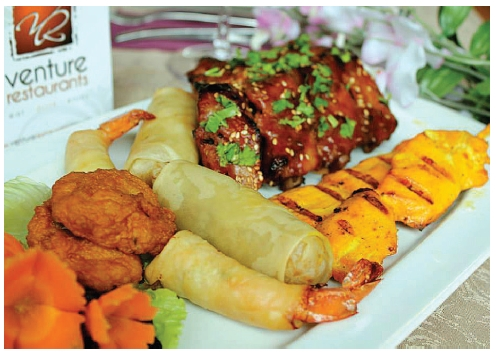 Experience contemporary Oriental dining at its finest with a visit to Thai Botanico, situated on the first floor of the Safari Commercial Centre. Absorb the sights, sounds and flavours and allow your senses to transport you to a tranquil corner of The East. The restaurant’s Thai chefs bring a modern touch to what is a traditional style of cuisine, and every dish is an explosion of flavours. Only the best ingredients are used in the preparation of the venue’s gourmet dishes, embodying the very essence of the Orient, while Thai Botanico’s surroundings offer a rich blend of authentic Asian artefacts, exotic plants, stylish design and a refined ambience. A true paradise! For a stylish venue to hold a work event, or any kind of private or professional dining experience – whether it’s a first date with someone special or a business dinner – you won’t fail to impress at Thai Botanico. To start, we enjoyed the selection of special mixed hors d’oeuvres (Ruam Mit starters), which included chicken satay skewers, spring rolls, Thai fish cakes, prawn rolls and succulent ribs. For main, we ordered four different dishes - Green Thai Curry, Braised Lamb Masaman Curry, Sea Bream in Lemon, Chilli and Garlic, and the Weeping Tiger Fillet Steak. We tried each other’s plate and were blown away by the quality and variation of each dish, as well as the affordable prices for such excellent food and stylish surroundings. Topped off with a fine bottle of Veuve Clicquot Ponsardi and a return visit to Magic Lounge Club for a digestif and some nocturnal niceties, including a boogie to the excellent house band, and we had just experienced the perfect evening. Magic Lounge Club is situated next to Hard Rock Cafe Tenerife on Playa de Las Américas’ prestigious ‘Golden Mile’, opposite the Safari Shopping Centre where you will find Thai Botanico on the first floor. www.thaibotanicotenerife.com or the Venture Restaurants group website: www.venturerestaurantstenerife.com. Also see their Facebook page: www.facebook.com/venturerestaurants tenerife. Produced with news.CMS in 0,0679 seconds.